We offer this complete and effective business tool to record activity or dispatch & track your fleet in an effective, efficient and inexpensive manner. Only $7.50 per user per month. Don't be mislead by the low price - this tool delivers. Try it out - the first month is free! 100% web-based, this multiple company, multi-user application is accessible by authorized personnel anytime from anywhere. Across town or across the continent - users/coders/approvers have secure access. Your data is stored securely and backed-up daily. Single-source twice over - single application code base (indeed single instance) - single data source so everyone is using the same data. We handle the security, backups, and updates. This application offers comprehensive activity recording/tracking and dispatching at a fraction of the administrative, resource and financial costs of a legacy system. Data access is intuitive and immediate. Lost activity is eliminated by the very nature of the process. It is truly a collaborative, interactive and highly visible process. Staff can readily monitor and manage the process. Operators/drivers can manage their current activity & dispatch data and reference relevant historical activity. The overall result is control, visibility, reliability, easy buy-in by drivers & admin staff, efficiency that will accrue to your bottom line and peace of mind that you are ahead of your operational segment, not trying to catch-up. The mobile module gives operators an intuitive and comprehensive tool to complement their function. Operators record their activity and can view/edit what they have recorded. 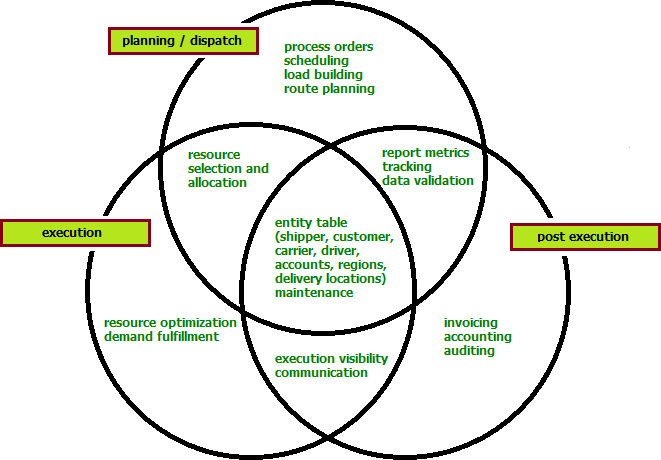 Dispatch data (if used) enhances visibility and simplifies data entry. Push a dispatch schedule to the mobile devices and drivers will generally just need to click an icon and update an activity’s date/time. Unscheduled activity is easily recorded and notes/pictures upload and tie to the track records. Syncing of data between mobile devices and the main application (dispatch schedule updates and completed activity data) is automatically induced when the device is in network communication (cellular or Wi-Fi) and the home page is accessed. Syncing can also be manually initiated as required. Both Wi-Fi and cellular capable devices are supported. Most recently manufactured android (chrome browser) and apple (safari browser) mobile devices can facilitate offline activity capture and intermittent syncing though ancillary activity such as camera/pallet & GPS can be hardware dependent. HTML5 web interface facilitates offline activity data capture. Forms, notes and pictures captured on the mobile devices can be uploaded and associated with activity data. Rudimentary gps capture and mapping available. An import API is available for data upload if you choose to capture gps data by other methods. Schedule creation, demand tracking, contact capture, customer relations or problem resolution - IDATA provides effective access for all staff irrespective of their role and responsibility. Syncing of manifests (demand data), account data (shippers, consignees, delivery locations, etc...) and validated activity data captured is simple and timely (supported via CSV). Both nightly and on-demand syncing supported. Check out the screenshots for a better sense of the functionality and capability of the application or sign-up and try it out. IDATA will readily work with many of your existing processes adding functionality that will enhance performance and visibility. Data exchange API's (web services) make this easy and efficient. IDATA is an application that will support your truckload, less-than-truckload and parcel dispatching and tracking demands for local activity. You can pattern the use of the application in a number of ways without committing to any particular configuration. Essentially shifting the data processing burden as best fits you immediate requirements - as indicated in the following table. Syncing delivery locations and manifest data with your mobile devices will shift the data entry burden away from the driver and assure valid entries since they will be able to select those values from a list rather than typing a text value which will later need to be converted to an actual delivery location or manifest reference by your admin staff after it is uploaded to the main application from the mobile devices. As indicated not syncing that data results in the largest burden for both drivers and admin staff. Adding dispatching will reduce the burden on the drivers to the point that, other than the exception, they will only need to update the activity date/times to effectively perform their function and allow your dispatching staff complete control and efficient time resource utilization doing what they will need to do anyway - dispatch activity. The exceptions can still be handled by the drivers and completed by your admin staff. Uses the latest industry standard 2048 encryption in SSL (Secure Sockets Layer) to prevent unauthorized access to information in transit. Each user is authenticated by credentials that uniquely identify them to the system. User roles and project rights assignment control user acccess. Simple user substitution and replacement methods for changing user roles and employment. Comprehensive logging provides details of user and device activity. Exception: The mobile module uses HTML/HTML5 not HTTPS. Application and system access is restricted to a web service exchange of data via a syncing process and to secure cloud storage of restricted file types. Centralized repository, process logging, policy enforcement and simplified access all contribute to support compliance and accountibility. Standard Pricing - $7.50 per user per month. Monthly billing for the number of active users times the base monthly per user rate - no additional fees. There are no set-up fees. The service is month-to-month and you may cancel at any time. The first month is free! Sign-up to try it free for 30 days - then subscribe to continue to use it. * Contact us for an enterprise instance. Send link to this web page to a friend.